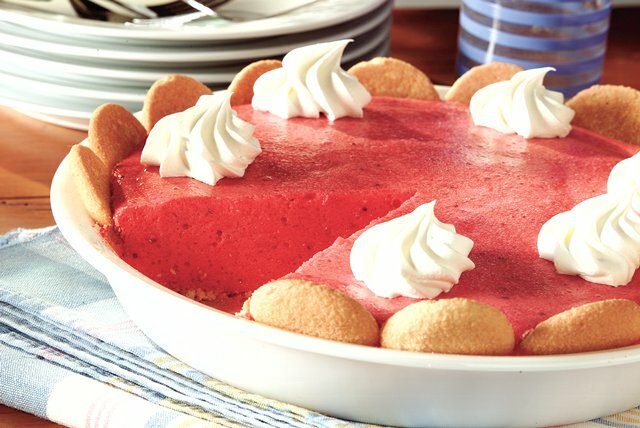 Puréed strawberries and strawberry gelatin are beaten with vanilla yogurt until fluffy, then chilled in a cookie wafer crust for a refreshing dessert. Place strawberries in blender; blend until pureed. Set aside. Stir boiling water into dry gelatin mix in medium bowl until dissolved. Add strawberry puree; mix well. Refrigerate 45 min. or until slightly thickened. Add yogurt; beat with electric mixer on low speed until light and fluffy. Line bottom and side of 9-inch pie plate with wafers. Fill with the gelatin mixture. Refrigerate 2 hours or until set. Top with the whipped topping just before serving. Store leftovers in refrigerator.